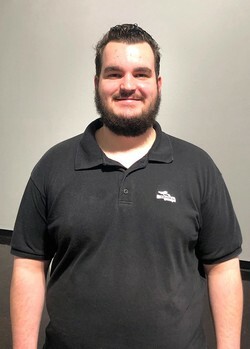 The SFA Friends of the Visual Arts have selected freshman filmmaking student Samuel Langston of Lufkin as the first recipient of the newly established William Arscott Art Scholarship. NACOGDOCHES, Texas - The Friends of the Visual Arts at Stephen F. Austin State University have selected Samuel Langston, a freshman from Lufkin, as the first William Arscott Art Scholarship recipient at SFA. Langston is studying filmmaking in SFA's School of Art. Jeff Brewer, assistant professor of sculpture, nominated Langston for the scholarship. "I have had the pleasure of knowing and teaching Sam over the past year. He is a dedicated student and budding young artist," Brewer wrote in his nomination letter to the SFA Friends of the Visual Arts. Brewer said Langston has "a passion for filmmaking" that became evident in his SFA 101 class. "Sam is not only a hard worker, he's a passionate student, sociable, witty and very level-headed," Brewer said. "I have enjoyed watching Sam grow as an artist and as a person, gaining confidence in his talents and his direction in life. He always represents SFA in a most professional way. Sam will do great things, and I look forward to seeing it happen. " The FVA will award the Arscott Scholarship annually to one SFA art student to aid them in furthering their educational and professional goals in the field of art. Arscott is the senior member of the art faculty and has worked in many artistic fields, including painting, ceramics, printmaking, sculpture and cinematography. In 1980, he established the cinematography program for the School of Art. Distinguished as both an artist and educator, Arscott has been recognized and awarded many honors, including Texas Senate Resolution No. 514, Outstanding Educator of America, Alumni Distinguished Professor and Regents Professor. The FVA has established several scholarships in the name of retiring SFA School of Art professors who were employed in the School of Art for a minimum of 10 years before retirement and who contributed in a significant way to the mission of the Friends of the Visual Arts board and its fundraising activities. In this instance, Arscott is still working at the university after more than 54 years of teaching there and is SFA's longest-tenured faculty member. FVA scholarship committee members decided they wanted to honor Arscott now, prior to his retirement.